This is a bit of a unboxing/review/happy-to-be-back-in-the-hobby piece. Much of this was written in March of 2013, so if the references to time seem a little out of whack, that's why. I've decided not to rewrite them, but have held off posting any of this until now because I wanted to make sure I had some actual at-the-eyepiece time with the scope, then it took a while to actually get back to this. For most of the past few years, I've been mostly dormant in the hobby owing to work issues (long, long, work weeks) and location (living smack dab in New York City). When the we changed jobs and locations back in 2009, I greatly reduced my astro gear, and did only some highly intermittent observing. Last Spring, the wife and I decided we both needed a change of job and scenery (NYC is a great place to live in many ways, and we still miss a lot about it...but ultimately not the place for us to settle permanently), we moved back to south-east Michigan because of job prospects. The Mrs. had her more-or-less first choice job waiting for her, and I also got my first choice job...after about 6 months of a temporary job and a few weeks unemployment. But hey, better late than never! Everything has actually fallen into place, it just took a little time. 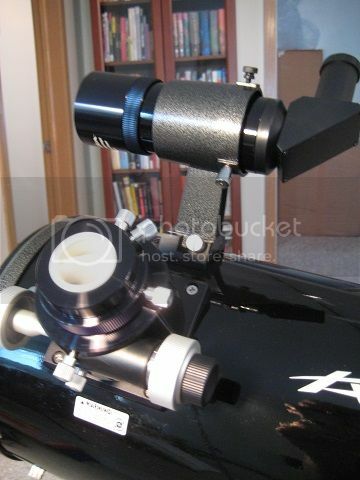 In the fall, I got a fair bit of observing in with my residual equipment - an Orion Starblast being my only scope. This winter has been truly dreadful for observing here in SE Michigan, so I haven't done too much recently (too bad, unemployment is perfect for Astronomy!). However, with the greatly improved financial situation, I'm finally "re-gearing". I thought I'd share the process a bit. 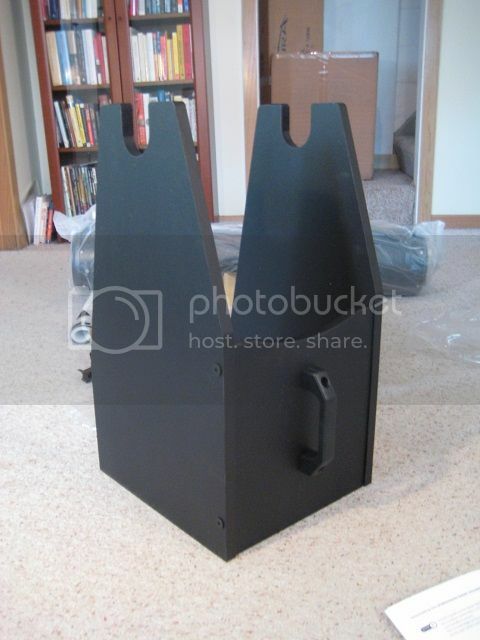 I don't know that I'll offer any great wisdom or insight, but I know I really like reading other people's reports of getting, assembling, and using equipment, so maybe some folks will enjoy this. If we didn't have other major financial hurdles coming up - going on the market for a home being the biggie - I would have done things a little differently. I've been salivating over the Delos line ever since it was introduced, but I can't really justify that right now, given an (almost) perfectly satisfactory set of eyepieces. Being a big advocate of basic solid-tube 8-inch dobs, I would have loved to go for what seems like the best such scope on the market right now: The Teeter STS 8. But...maybe in a few years Rob will see some of my money. I also sprang for the "Tweakers Dream Package". I'm not convinced it's a bargain, but all of the tweaks and accessories are desirable, and I'm betting I wouldn't have done as pretty of a job with the flocking. Hats off to Opticsmart, and especially David at Opticsmart, for great service: speedy, communicative, and helpful with some questions and feedback I had. 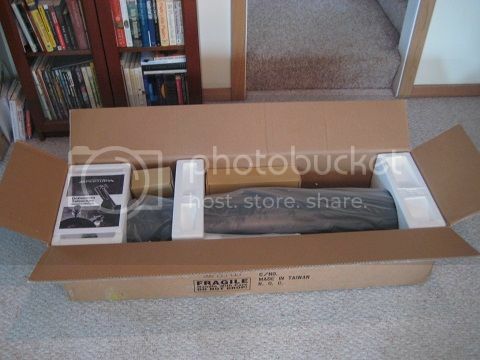 I ordered on a Monday, and the 'scope arrived in Michigan from Alabama on Thursday. Can't complain about that! 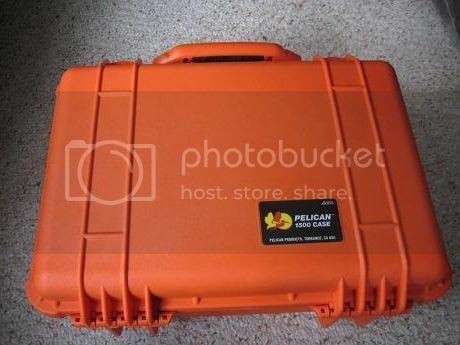 The smaller, standard accessory tray is in the white box. 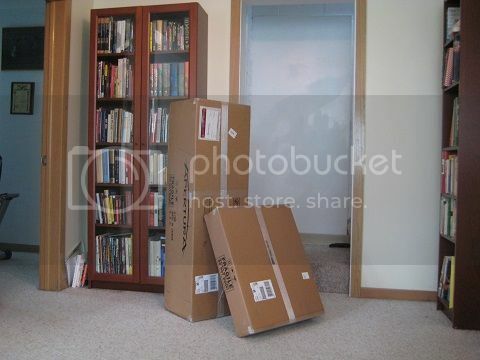 Everything seemed snug and securely packed in the box. This doesn't seem...overly protected. But, everything was still snug and secure on arrival, so it was certainly good enough. 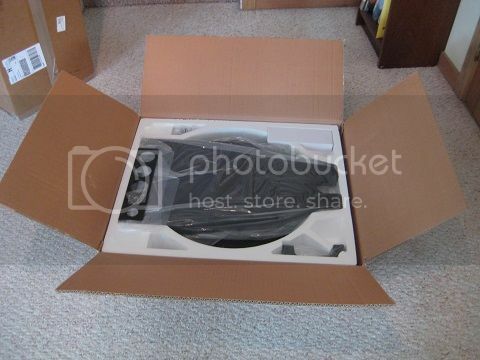 The rolled-up tube visible center-left in the picture is the light shield included in the "Tweaker's" package. That's the laser collimater on the lower left, side bearings for the optical tube on the far end of the box, below them are the battery pack for the primary cooling fan and the 30mm 2-inch eyepiece. Below that are the 9mm Plossl, the moon filer in a case (big enough for 3 other 1.25inch filters), and the 35mm extension tube to provide additional back-focus if needed. It's pretty much idiot proof, although I did rise to the occasion a time or two. But if you pay attention to the pictures, it's about as clear as can be. 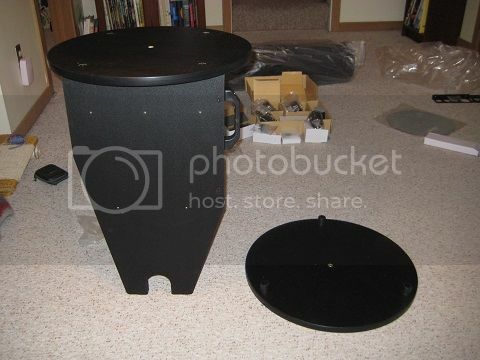 Putting this together is as simple, if not simpler, than basic IKEA furniture assembly (or other flat-pack furniture you may get). 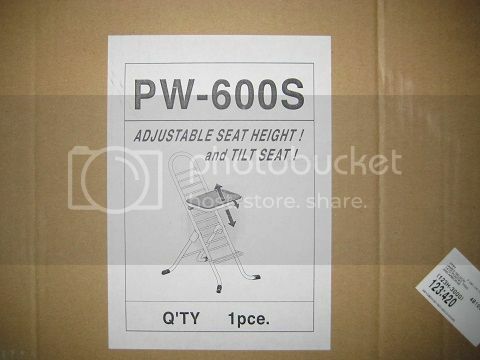 Mostly you use an included Allen wrench, although you do need a Phillips head screwdriver for a few steps. and attaching the tension adjustment knob to the azimuth axis (not visible in the picture). As pictured in the manual, the orientation of the optical tube is ambiguous when you put on the side bearings; I suppose normal people would assume that the top of the tube should be up when you put on the side bearings, but I didn't. This matters because they helpfully show the correct balanced starting position (which isn't centered), but because I had the tube reversed, I was way out balance. Not a big deal. Attaching the finderscope is easy. It uses the same dovetail system as my Orion dob did. This includes having the base oriented so that you slide the finderscope *forward* to lock into the base. This has always struck me as strange. Seems to me that if the locking screw is loose, the finder is much more likely to fall out than if it slid *back* into the base, but apparently scope manufacturers don't agree with me. That's the finder with a makeshift dew shield: A vacuum-tube coupler available at most any hardware /home store. It's just a black plastic cylinder that happens to fit perfectly onto the existing dew shield, and holds on firmly just by friction. The big white knobs lock the mirror in place, the black knobs adjust primary tilt. 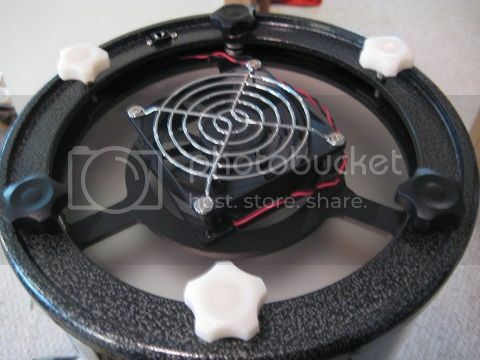 This also shows the cooling fan, and the plug for the fan's battery pack is just left of the top. 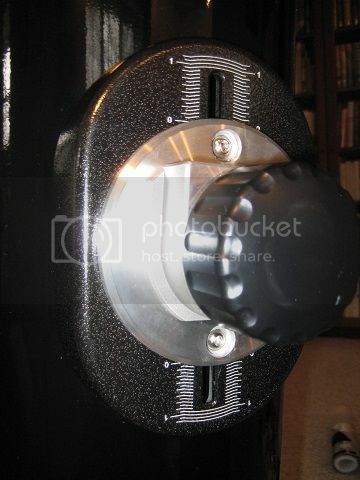 First, it shows the secondary adjustment knobs, one of the "tweaks", for far easier hand-adjustment of the secondary. It also shows the velvety dark blackness of the tube from the flocking (one of the other tweaks). It's perfectly applied and is about as dark and non-reflective of a surface you'll find. This is the scope with the light shield on, and also my Rigel Quickfinder, on the far side of the focuser. The Quickfinder doesn't quite fit between the finder and the focuser, where I would have preferred to place it, so it's perhaps not optimally placed - I have to lean over a bit to use it. I think it will work fine, but only a few nights under the stars will tell me if I'm right. (Added later: A little awkward, but it's good enough). I also bought (re-bought, in some cases), some accessories, I thought I'd quickly share that as well. 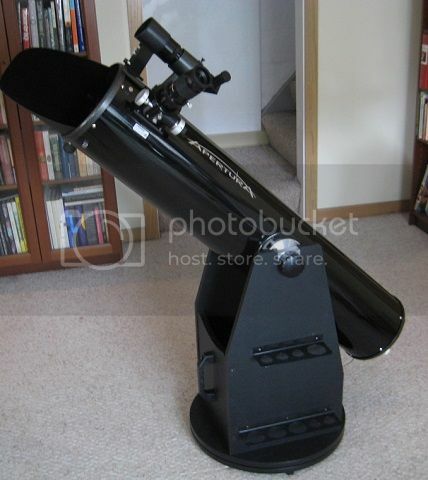 I used to have a Star Dust Observing Chair, and boy did I love it, and so I bought another one from Hands On Optics. I was in for a little bit of a surprise, though. Mechanically it's the same as my old Star Dust, but has a different color scheme, isn't labeled "Star Dust", and doesn't come with the tape-on reflectors. None of these are big deals, but this is just the stock work chair the older Star Dust chairs were based on, available elsewhere (for less). 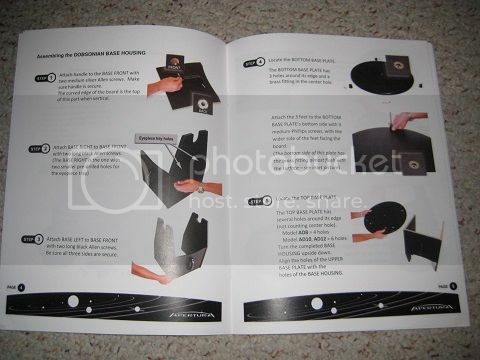 The Hands On description no longer mentions reflectors (although the pictures show them), and if I had researched this on the forums I would've had some warning (and probably would have bought the work chair version...since this IS the work chair version). 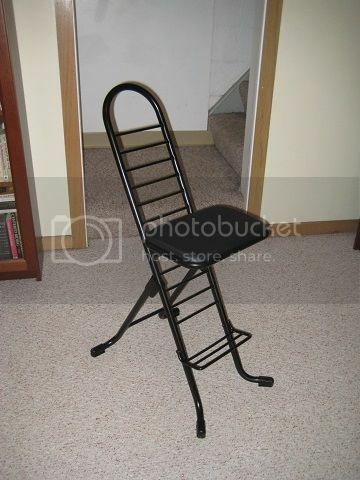 Still, it's an excellent observing chair. I've never had a 2-inch focuser. Not wanting to spend a fortune, and wanting something fairly lightweight if possible, I settled on the Astrotech Titan Type II 35mm from our sponsors, Astronomics. Seems very nice mechanically, with a nice adjustable rubber eye guard, and good eye relief. Can't wait to try it. The 30mm may well be a nice eyepiece, too, I don't know yet. However, it doesn't give all that much more true field of view than my 24mm Panoptic, and I wanted something that would come closer to 2 degrees FOV (the AT 35mm gives about 1.9 degrees FOV with this scope). 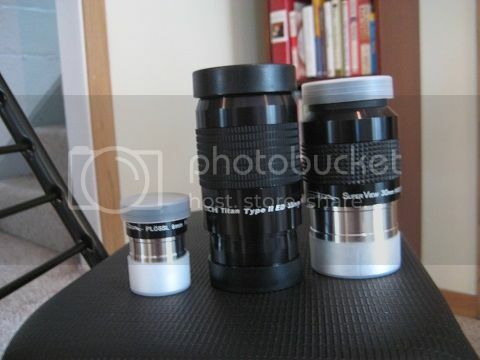 I also bought a new 2-inch Thousand Oaks Narrowband filter (no picture). Can't wait to try it on the North America Nebula and Veil this summer! 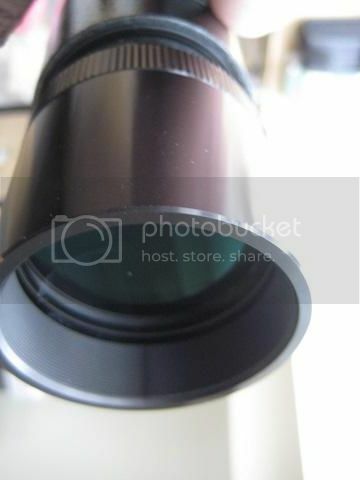 The smaller eyepiece is the included 9mm Plossl. 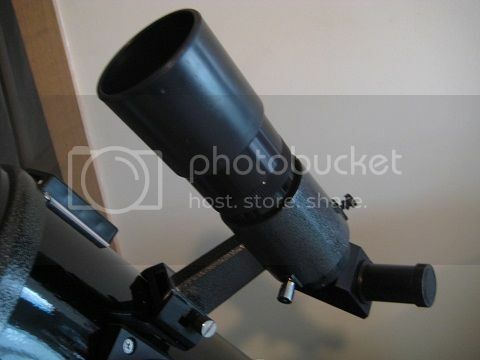 Included for size reference are a 7mm Nagler T6 and a Meade 20mm Plossl. 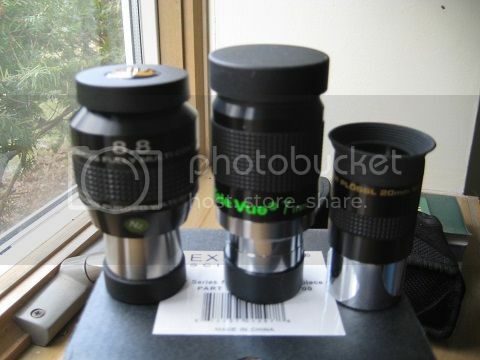 Yes, the 7mm and 8.8 mm are pretty close together, but I think of the 7mm and 5mm eyepieces I have as my "planetary/high power" set, and I needed another mid-power to complement my 13mm Nagler T6. 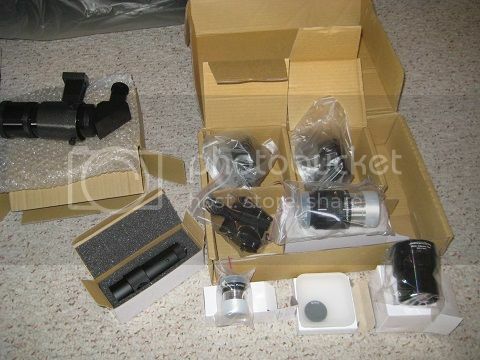 Magnifications for my main eyepiece line up now runs: 34x, 50x, 92x, 136x, 171x, 240x. That works for me. 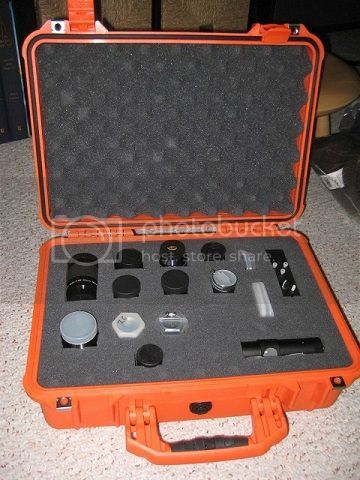 The open case shows my "main" eyepiece set on the top half, my secondary set on the bottom, my filter cases, my Rigel QF(with my red LED flashlight underneath) and my laser collimator (with a screwdriver underneath - don't often need one, but I've found that when you do, you REALLY need it). 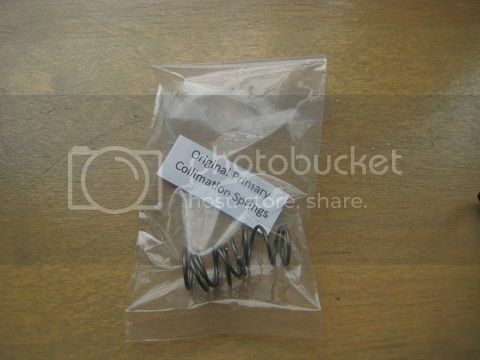 There's also an inexpensive Celestron barlow, mostly for primary mirror collimation. 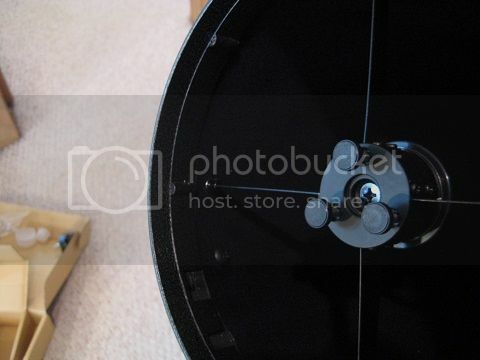 Collimation provided a few issues that required some communication with David from Opticsmart and with the good folks on the Cloudy Nights reflectors forum. 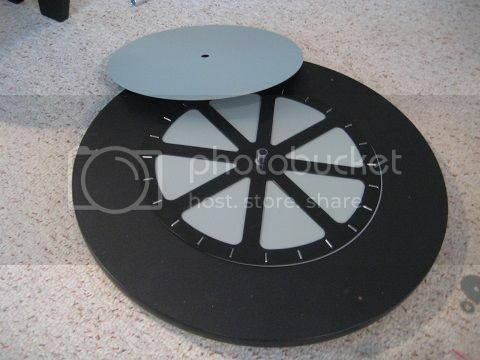 The focuser on this sample is a little bit out of square. The short version of the story was that the secondary is currently right at the limits of its adjustability, but it is enough. If I get ambitious one day I might shim and align the focuser itself. None of this is a huge deal, but a beginner without any collimation experience might have taken a long time to get this ironed out. The included laser collimater is pretty darn close to being perfectly collimated itself, although I didn't rely on it for the secondary adjustments. It's probably good enough as-is to make the final primary adjustment, but I purchased an inexpensive barlow and use that combo to align the primary on-the-go. Other than not being able to use it nearly as much as I would like, I'm very happy with the scope. After some initial fussing with the movements, the scope mostly disappears. It could use a bit more "stick" in its "stiction" for azimuth movement, perhaps. At 240x, I have no trouble whatsoever with tracking. My old XT6 (similar to the "Classic" XT still for sale) was usable, but not very fun to use, at 200x plus; the movements were a little too herky-jerky. While you could improve the motions of the XT, this AD8 has tension adjustments built in and just moves much more smoothly without mods. It's just heavy and cumbersome enough that it needs to be carried in two pieces (base and optical tube), and I'm using a scuba tank holder as a tube handle. In my case, the scuba tank holder is just barely adjustable enough to fit the AD8's tube without extensions. Optically I'm very pleased. Of course, 8inches > 6inches >4.5 inches, so of course there's a noticeable bump in performance from my old XT6 and my Astroscan. I'm not an expert star-tester, but with that caveat I see less than 1/4 wave undercorrection and nothing else. The Cassini division stands out crisply when seeing allows, plenty of detail is visible in Jupiter's cloud bands, and bright globulars show pin points all across. My current usual highest power of 240x doesn't seem to be pushing the scope's limits at all - at only 30x/inch, it shouldn't be, but at least it shows that the optics meet conservative quality expectations, and the scope performs like a decent 8 inch scope. On the other end of the magnification scale, with the 2-inch focuser I get amazing widefield views. Scanning the Milky Way is just too much fun, and with a 2-inch UHC filter, views of Orion's Sword, the Veil Nebula and the North America Nebula are gorgeous. The Lagoon is almost unrecognizable to me there's so much nebulosity visible. An 8-inch f/6 dob is one versatile scope! That looks a cracking scope, I had one of the Orion XT8,s for a couple of years,rather regret letting it go,this Apertura seems to be very nice, enjoy yours, DA. Good job in describing your experience with this scope. I, too, have been toying with the idea of purchasing the 12-inch version with the Tweaker's package. It seems to be a fantastic bargain for an excellent scope and it may not take much to put me "over the edge" and buy it. Thanks for the excellent review. Your posting is sure to help inform the decisions of those thinking about a dob. Thank you. I strongly considered an XT8g, too. Since I was more interested in tracking than go-to, I decided eventually getting an eq platform that I could use with >1 scope would be a better course for me. Jim, welcome back to Michigan and a fine choice in that Apertura AD8 with Tweakers Package. If I had to choose now as a new scope buyer, I would take that over the XT8i that I have. At the moment, I bit on an XT8g for the tracking mainly though. 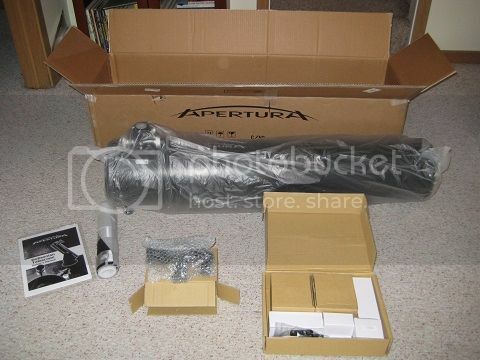 I have an XT12g and I just bought my wife the Apertura AD8 with Tweakers Package. Congrats on your return to the game and it sounds like the 8 inch is working well for you. I still have my 8 incher. It's such a versatile size I doubt if I will ever let it go. Very nice write up, the photos are very helpful and it looks like the manual is actually clearly shows assembly step by step. 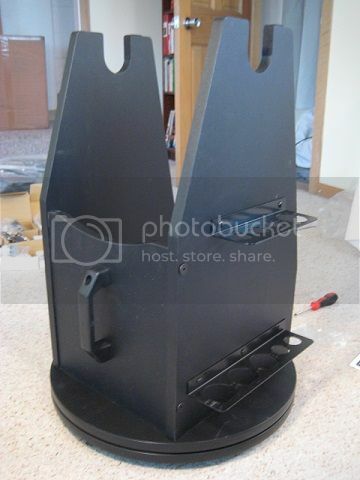 I have owned a number of GSO and Synta Dobs but never a new one so I am glad to what you get and what is needed. Do you know if the manual is standard with all GSO dobs or it is something that David has provided/produced on his own? Hey Jim, thanks for the great write-up and photos (and the nice compliments). I'm very proud that you chose Apertura to help you get back in the game. Jon, we produced the instructions in-house (but have them professionally printed of course). We've revised them several times as customers have made suggestions and plan to continue improving them as time goes on. 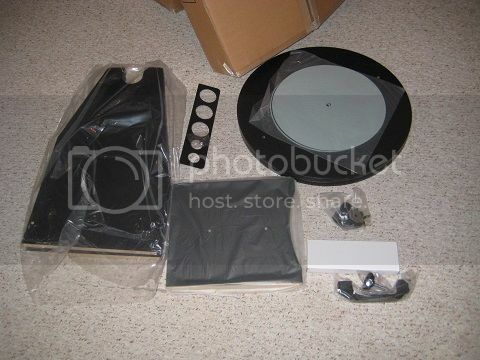 Orion has introduced the "Orion SkyQuest XT8 PLUS Dobsonian Reflector Telescope", which seems like a more direct comparison in many ways (maybe even a response to the Apertura). The Orion includes the finger-adjustable secondary in its base price, which is more than the base price of the Apertura but less than the shipped AD8 with Tweaker's package. It still doesn't have an optical finder, cooling fan, or flocking, or a laser collimater, but does come with a solar filter and a barlow. The Orion is also a bit lighter. The AD8 is still the better deal to me, all around, but that may depend on how much you value various options. Yes, there was a thread about this scope in this forum recently. I still like the AD8 with the tweaker's package better. Opticsmart customer service is wonderful too. I had a manufacturer issue with my finder scope, talked to David on the phone and he said that he would send a new one out right away. I can't give him, the scope, or the tweakers package enough praise. I've been toying with the idea of getting a dob for visual use while I use my C9.25 for pics and this sounds like a great deal!! It's a beauty Jim! I would certainly consider Apertura for both the product and the great customer service. Congrats on the new scope. Apertura seems to have a very nice package there and I know you will enjoy it.